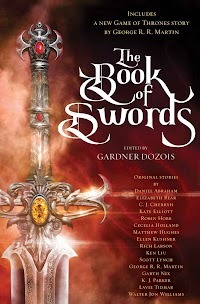 "The Colgrid Conundrum," by Rich Larson [bio] (edited by Gardner Dozois), appeared in The Book of Swords (RSR review), published on October 10, 2017 by Bantam Books. Pro: Superficially, the plot is very clean: they get their box opened, extract the treasure, and go on their way. That pretty much sums up the plot as far as Crane is concerned, although it’s spoiled for him a bit by the fact that his and Gilchrist’s partnership has been poisoned by the episode. Gilchrist, though, is seeking absolution for the single father they killed in a previous town. Toward this end, he gives a coin to Skadi who later helps them infiltrate the factory, free the children, and capture Riker. His accomplishment is unsatisfactory, in the end, though, because he realizes he may have freed the children just for them to starve or freeze to death, sent Skadi back to an abusive family, and perhaps killed Riker only to have someone even worse replace him. Crane’s nonchalance about it all pisses him off. Merin’s arc is a simpler one: she simply wants her revenge, although we never learn if she actually takes it. Beyond the plot, the characters are great. Talkative Crane is so oily he fits the smoggy city perfectly. His dialogue is one of the special pleasures of reading this story. Taciturn Gilchrist is haunted but efficient. Merin is angry, fearful, irresolute. And Riker, who at first seems like a caricature of a cardboard villain has at least a touch of humanity when we meet him—even if he’s still pretty horrible. Finally, the setting is grimness itself, with air so toxic people wear masks and smoke so thick it’s dark even during the day. Con: Riker’s still pretty cardboard even at the end. He not only has child workers—he chains them in his factory at night. He’s fat, he’s mean—I suppose his replacement could be worse, but it’s hard to see how unless he actually ate the children. This undermines the final message.